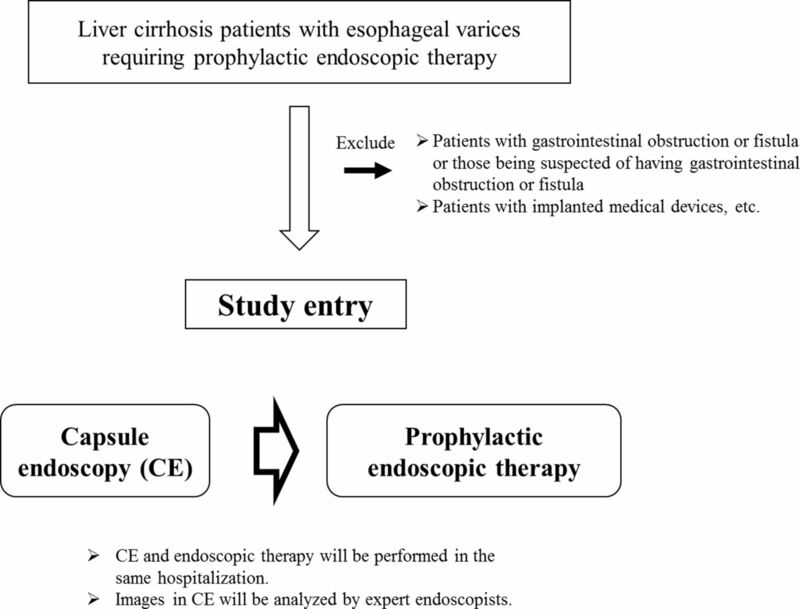 Introduction and aims The role of capsule endoscopy (CE) in patients with liver cirrhosis (LC) has yet to be established; however, it is likely that it will remain a valuable diagnostic modality in several groups of patients with LC. The primary aims of the current prospective interventional study are to examine the prevalence for small bowel lesions and transit time of CE in the gastrointestinal tract in patients with LC with oesophageal varices (EVs) requiring endoscopic therapies. Methods and analysis The current study will be a single-centre prospective interventional study. Our study participants are LC subjects with portal hypertension who were determined to be necessary for prophylactic endoscopic therapies for EVs. From the view point of safety, patients with gastrointestinal obstruction or fistula or those being suspected of having gastrointestinal obstruction or fistula will be excluded from our study. Patients with implanted medical devices will be also excluded. CE will be performed prior to prophylactic endoscopic therapies in the same hospitalisation and relevant images will be analysed after 8 hours by expert endoscopists. This study will continue to recruit until 50 participants. Ethics and dissemination This study has received approval from the Institutional Review Board at Hyogo College of Medicine (approval no. 2680). The study protocol, informed assent form and other submitted files were reviewed and acknowledged. Final data will be publicly scattered regardless of the study results. A report releasing study results will be submitted for publication in a suitable journal after being finished in data collection. Trial registration number UMIN000028433 (https://upload.umin.ac.jp/). Considering these backgrounds, in the current prospective interventional study, we will primarily aim to examine the prevalence for small bowel lesions and transit time of CE in the gastrointestinal tract in patients with LC with EVs requiring endoscopic therapies. Patients aged 18 years or more. Patients with PH who were determined to be necessary for prophylactic endoscopic therapies for EVs such as EIS and EBL. Patients will be excluded if they meet one or more of the following criteria. Patients aged less than 18 years. Patients with gastrointestinal obstruction or fistula or those being suspected of having gastrointestinal obstruction or fistula. Patients with gastrointestinal stenosis in whom CE will be remained in the same place. Patients with cardiac pacemakers or other implanted medical devices. Patients in whom consents for removal of remained CE are unable to be obtained. Patients who are unable to receive open surgery. Patients who were judged to be inappropriate for the study subjects. Study design: single-arm and open-label trial. Our study participants are LC subjects with PH who were determined to be necessary for prophylactic endoscopic therapies for EVs. LC will be mainly determined by radiological findings such as CT and ultrasound (deformity of the liver surface, the presence of ascites, atrophy of the right lobe and/or compensatory swelling of the left lobe) and/or pathological findings. The current study will be a single-centre prospective interventional study. We will prospectively register appropriate candidates. The CE is disposable and is naturally discharged at the time of defaecation. CE will be performed with a video capsule endoscopy device (PillCam SB2 plus capsule; Given Imaging, Tokyo, Japan) prior to prophylactic endoscopic therapies for EVs. CE and prophylactic endoscopic therapies of EVs for each participant will be performed in the same hospitalisation. Study participants will swallow the capsule in a sitting position with a solution of dimethicone after an overnight fast, without any other preparation.25–27 After 2 hours from swallowing of the capsule, participants will be allowed to drink clear liquids. After 4 hours from swallowing of the capsule, participants will be allowed to eat a light meal. After 8 hours, the sensor array and recording device will be removed and images will be analysed. Two expert endoscopists will make diagnoses after reaching an agreement with each other (figure 1). Prevalence for small bowel lesions (small bowel lesions will be defined as follows: (a) vascular lesion or (b) ulcerative lesion). Tumour lesion will not be included for small bowel lesions in this study. Transit time of CE in the gastrointestinal tract (oesophagus, stomach, duodenum and small bowel). Detection rate by capsule endoscopy for upper gastrointestinal lesions (upper gastrointestinal lesions will be defined as upper gastrointestinal varices or mucosal lesions whose presence was confirmed by EGD). CE not being ejected outside the body within 2 weeks after initiation of the procedure indicates the stay of CE in the gastrointestinal tract. The incidence of this complication is reported to be 0.5%–2% in previous studies.19 29–31 When bowel obstruction-related clinical symptoms (vomiting or abdominal pain) occur and they will not be cured by conservative therapies, removal of capsule by small bowel endoscopy or open surgery is probably needed. This risk will be informed to each participant prior to study enrollment. From July 2017 to March 2020 (there may be a change depending on registration status). presence or absence of abdominal symptoms. Data will be transferred to JMP V.13 software (SAS Institute, Cary, North Carolina, USA) and all data will be checked to ensure their consistency. Quantitative variables will be compared by unpaired t-test. Categorical variables will be compared using Pearson χ2 test or Fisher’s exact tests as appropriate. This study will not stipulate a sample size by statistical power calculations. However, considering that approximately 80 LC subjects will annually consult our department, the current study will continue to recruit until 50 participants. Gastroenteropathy is a lesser recognised complication in patients with PH and consists of different changes in the mucosa of the small bowel which result in the appearance of vascular and inflammatory abnormalities.32 It can be a key factor for the development of anaemia in patients with LC, and recently an easy and non-invasive diagnosis is able to be made by CE. However, it is rarely considered for the management of patients with PH.32–34 Additionally, delay of transit time of CE in the gastrointestinal tract will be expected due to PHG-related decrease in the peristaltic movement.5 17–19 Thus, there will be urgent need for clarifying these issues. To the best of our knowledge, the current study is the first prospective interventional Japanese study to investigate the diagnostic usefulness of CE for gastrointestinal lesions in patients with LC with EVs requiring endoscopic therapies. From the view point of safety, CE and prophylactic endoscopic therapies for each participant will be performed in the same hospitalisation in this protocol. One study drawback is that the current study will be based on a Japanese population, and additional investigations on different ethnic populations are required to further verify the efficacy of CE and extrapolate to races other than Japanese. Another drawback is that this study is not a randomised trial. However, if the effectiveness of CE in patients with LC is confirmed in this trial, useful information will be provided for clinicians. This study has received acknowledgement from the Institutional Review Board at Hyogo College of Medicine (approval no. 2680). The study protocol, informed assent form and other submitted files were carefully reviewed and acknowledged. Trial registration number is UMIN000028433 (https://upload.umin.ac.jp/). On recruitment, the study assistant will give a unique scrambled identification number to each participant. Only the identification number will be used to identify participants. Data sheets and any printout of electronic files will be saved in a locked filing cabinet in a secure office in the Department of Hepatobiliary and Pancreatic disease, Department of Internal Medicine, Hyogo College of Medicine, Hyogo, Japan, with limited access. Final data will be publicly scattered regardless of the study results. A report releasing study results will be submitted for publication in a suitable journal after completion of data collection.
. Portal hypertensive intestinal vasculopathy: a review of the clinical, endoscopic, and histopathologic features. Am J Gastroenterol 1992;87:944–54. Health Quality Ontario. Capsule endoscopy in the assessment of obscure gastrointestinal bleeding: an evidence-based analysis. Ont Health Technol Assess Ser 2015;15:1–55.
. Alberca de Las Parras F, Carballo Álvarez F. Diagnostic and therapeutic features of small bowel involvement in portal hypertension. Rev Esp Enferm Dig 2017. Funding The current research will receive no specific grant from any funding agency in the public, commercial or not-for-profit organisations. Ethics approval Institutional Review Board at Hyogo college of medicine (approval no. 2680).